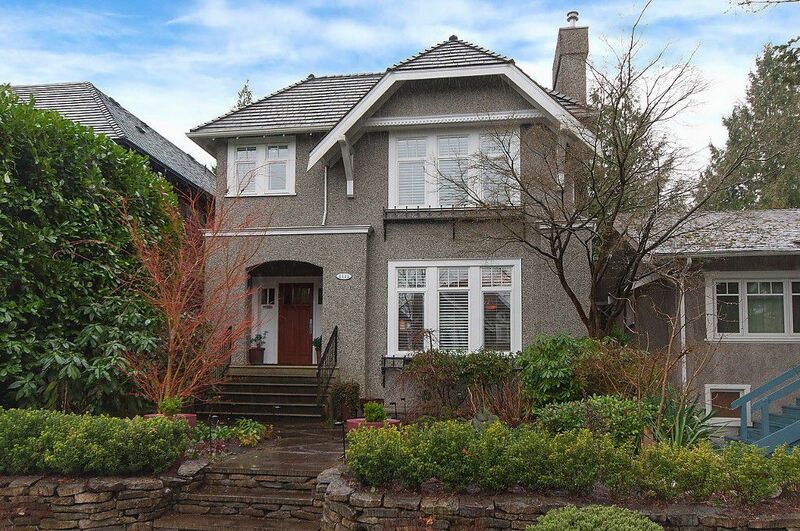 Custom built to the highest quality, Point Grey Craftsman/Tudor Home. Elegant inside and out with 9’ ceilings, custom millwork, and wainscoting throughout main and continuing to 2nd floor. Oak hardwood floors, built-ins, and fabulous layout with spacious eating area/family room overlooking south facing, private back yard and patio. Kitchen updated including new appliances (4 yrs), double ovens, and custom island. Upper floor boasts 11’ ceilings and beautiful skylights, along with 3 spacious bedrooms and an open concept loft/den area: master bath has deluxe ensuite. Upstairs and basement engineered hardwood flooring replaced in 2011. Lower floor features rec room with separate entrance, wet bar (2011), full bath, and huge crawl space for all of your storage needs. Gorgeous landscaped front and back yard (2012) designed to be low maintenance and colorful year round. Close proximity to Pacific Spirit trails, beach, and West 10th shopping. Conveniently located with transit options and within biking distance to downtown.